Researchers from the Ohio State University attached nanochip devices on mice’s skins to treat the subject’s legs which had blood flow problems. Tissue Nanotransfection (TNT) is used to inject genetic codes from the nanochip into living cells. The transfected cells underwent cellular reprogramming as they morphed from skin cells into vascular cells. Legs of mice were fully healed in three weeks. 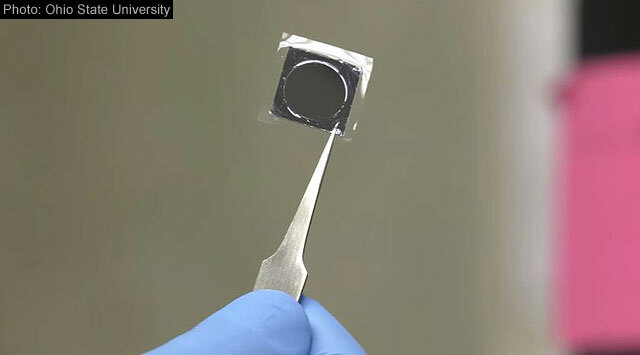 In what appears to be a breakthrough for regenerative medicine, researchers from the Ohio State University Wexner Medical Center developed a nanochip device that can repair damaged tissues with just one touch. The study combines the breakthrough technology of Tissue Nanotransfection (TNT) with cellular reprogramming to do the job on mice. The paper was published this week in the journal Nature Nanotechnology. TNT is composed of two stages. First, the chip, which contains genetic codes from DNA or RNA, is attached on the surface of the skin. Second, a small current is applied to the chip as a way to create channels in the underlying skin. These channels enable the chip to do “transfection”, defined as “the process of inserting genetic material, such as DNA and double-stranded RNA, into mammalian cells”. The chip is then detached and TNT is done. Cellular reprogramming will then start to kick in by morphing the skin cells into a type of cells required for treatment or repair of the subject’s disease or injury. The study’s subjects were mice whose legs had limited or blocked blood flows. After injecting the genetic codes, the mice’s skin cells were reprogrammed to morph into vascular cells, the cell type needed to repair the mice’s condition. Following the injection, a transformation was observed to take place within the first week. Active blood vessels then formed after the second week and the legs of the mice were fully healed by the third week. Cellular reprogramming has been instrumental in treating human diseases, drug discoveries and regenerative medicine. Somatic cells (cells that are not reproductive in nature) are reprogrammed to morph to become “pluripotent”. Pluripotent cells, which include embryonic stem cells, are like “starting” cells that can morph into any type of cells in the body. Cellular reprogramming has been here for more than 50 years but the process has always been challenging for researchers. Experiments are complicated, mostly inefficient. Another aspect is the limited cell sources and the reliability on viruses for transfections. However, by introducing TNT technology into cellular reprogramming studies, the approach as seen in this study is shown to be 98% efficient, non-invasive, painless and simple to implement. One thing that further excites researchers is that TNT application is not limited to skin cells alone but can be done on any type of tissue in the body. For instance, brain cells can be grown on skins of mice, harvested and then injected into the damaged brain. This aspect bodes well in the search for future cures of Alzheimer’s and Parkinson’s diseases. In addition, as the cells belong to the subjects themselves, there is no need for any immunosuppressive medications. Researchers are now hoping to start human trials next year.